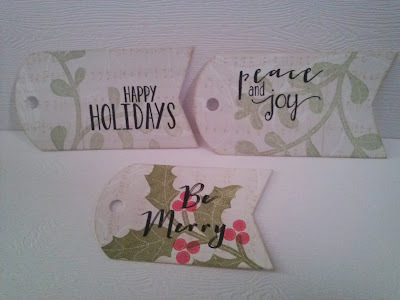 I stamped Mistletoe and Holly's images in Fresh pear ink and then another one (forefront) in Tuscan Olive before adding some of Maile's new sentiments from her 'Tis the Season sentiment set in Tuxedo Black ink (Memento). I used the Tag Sale #5 die on some PTI music background patterned paper. very pretty - love the music background! I love the music background paper, too! Great tags!! I love these ones, too! So, so, so, so pretty.